Very pretty color. I love it paired with the bright sweater. This week I found 2 pairs of jeans (one is neon pink), a silk dress, and a bracelet. I have been lazy about photographing my thrift finds, though. i love how you styled this!!! i have been thrifting striped mens button down shirts and taking them in and cropping them... best part is i had a 1/2 off coupon so they were 60cents each! crazy cheap! I thrifted this awesome leopard dress. Love the blue and green color combo, very cool. i love these colors together! i wish we had this store in California. My thrift store was slamming this week! -Lastly, a navy pencil skirt with gold buttons going down it!!!! My fave! I wish I could post pics!!!! I'm going to post about it tomorrow, and link you, because you've inspired me to thrift more! I never went before I started reading your blog... so thanks for inspiring me to try something new! I've liked your blog for awhile but never commented- but I thought I might let you know about a little trick I know for the chest-gaping shirt problem. I'm sure you're a good stitcher, from seeing the beautiful things you have made in the past, and while I know you're taking a break from sewing, this is just a very little bit- you can attach a little snap in the gape-y spot with invisible whip stitches and it totally makes the problem go away. I thrifted a button-up flowy blouse for $4.99! 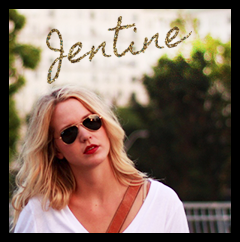 I will have an outfit post about it this coming week! I found a nice knife-pleat wool skirt in a great caramel tan- perfect for this fall! I love it when those finds let you stop drooling over full-price new things! 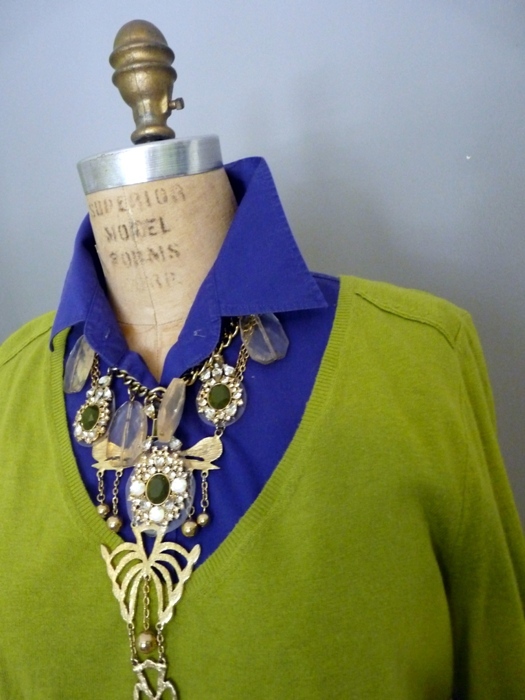 You are a styling virtuoso - fantastic color and necklace pairing! I hit the mother lode at an estate sale yesterday and came away with the best haul for a grand total of $35. Got a vintage plaid taupe/cream belted wool coat ($7), two vintage beaded wool knit shell/skirt suits ($7 each), a vintage chocolate brown wrap skirt with a dark red/dark green/mustard plaid border at the hemline ($4), a hand-crocheted granny-square vintage wool scarf ($1), a vintage gold/coral bib-style necklace ($6), 2 sets of vintage Vera print pillowcases ($1 for each set), and a vintage Vera floral hand-towel ($1). Going back today for the half-price day - I have my eye on a cross-stiched bed coverlet that was $125 yesterday. It's truly a masterpiece. I posted the pictures of what I thrifted! Suede skirt, Leather skirt, Silk scarf - 15$"
Those colors are great together & I LOVE that necklace!!! I thrigted this week many clothes from my mom's closet..and when I say a lot I mean it!! gleeps- did you get the coverlet??? Need to know! I thrifted quite a bit this week. Went a little crazy since I'm giving myself a short shopping time out (2 months). In the last week, I've gone twice spending roughly $150 thrifting (yikes!). Well worth it though. Hi Yen! Yes, I got the coverlet! It is white matelasse with cross-stitched orange and green flowers. I nearly knocked over a sweet old lady in my mad dash up the stairs to claim the coverlet, if it was still there (and it was!). I paid $62.50 for that (crazy cheap considering the hours and hours of work that went into it). For an additional $12.50, I got the following, all vintage: cream/brown wool space-dyed Evan Picone V-neck pullover sweater with pouch pocket in front brown leather buttons at the V-neck, taupe/cream/blue/pink tapestry maxi skirt with matching belt, cream cotton circle skirt with abstract black print, cream peasant-style eyelet blouse, khaki trenchcoat, belt made of brown leather links, a dozen scarves (some silk, some challis wool, some cotton), 4 necklaces, leather purse, hand-crocheted multi-color granny-square afghan. Deeply, deeply satisfying! I scored a sweet no name dress and a Diane Von Furstenberg for $6. It's frumpy but the pattern is amazing and I WILL make it work. You would look fab in this outfit - let's see it! My luck was so-so this week. I got a great pair of jeans and some nice gray trousers for work. Тhanκs foг ѕharing your thοughts about beach bags. An outstanding share! I've just forwarded this onto a colleague who has been doing a little research on this. And he in fact ordered me dinner due to the fact that I discovered it for him... lol. So allow me to reword this.... Thank YOU for the meal!! But yeah, thanks for spending the time to talk about this matter here on your site. it, you're a great author.I will always bookmark your blog and will come back down the road. I want to encourage you to ultimately continue your great writing, have a nice morning! Hi there to all, since I am in fact eager of reading this webpage's post to be updated regularly. It carries nice information. Anyway I'll be subscribing in your feeds or even I success you get admission to consistently fast.